45-year-old parachutist gets tangled in building wires in industrial area near Ma'ale Adumim; medics treating him for light wounds. A man who was paragliding crashed Friday morning into a garage in the Mishor Adumim industrial area, located just outside of Ma'ale Adumim to the east of Jerusalem. Apparently the parachutist got tangled in the wires above one of the buildings in the area while in the air. Rescues terms teams are working to help the man. Zakhi Heler, a medic for Magen David Adom (MDA), told Arutz Sheva that the 45-year-old parachutist was lightly wounded in his arm and leg, and that he is currently receiving treatment from MDA's emergency care crew. The man is fully conscious and is communicating with rescue crews on the site. The case brings to mind an incident roughly half a year ago, when four paragliders nearly crashed into IAF F-16 fighter jets that were taking off nearby. The four fighter jets took off from a base and with lightning reflexes broke their flight path within seconds so as to avoid the crash. The incident is still being investigated by civilian flight authority sources. 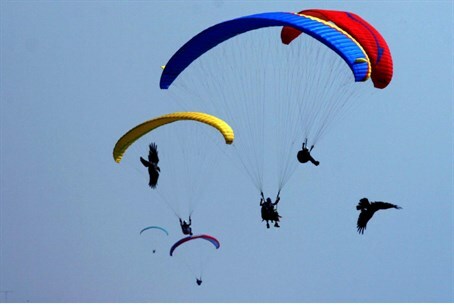 Paragliding at times risks crossing the line between sport and terror; one Israeli man was arrested in March on suspicion of selling paragliders to Iran for terror purposes. While the man owned a sports equipment export company, the shipment was planned to reached the United Arab Emirates (UAE) via Jordan. Israel has no diplomatic ties with the UAE, which prompted further investigations that found the final destination was Iran. Apparently the man had been in secret discussions with Iran over the shipment for two years. Security officials noted that paragliders could potentially be used for military activities or terrorist attacks, as they are capable of staying in the air for many miles at a time and can carry heavy loads.